Medication Safety plays a key role in hospital care and focusing on improvement in this area is an important part of wider quality and safety improvement programs. We know medication errors can impact patient outcomes, therefore safe and appropriate use of medicines is an important part of patient safety in hospitals. Fortunately, there is increasing knowledge on how to improve medication practices and it is important for hospitals to be aware of these measures so they can avoid medication errors. The Medication Safety Self Assessment ® helps hospitals assess their medication safety systems so they can be aware of the measures they need to take to enhance patient safety. The Medication Safety Self Assessment® (MSSA) program provides a structured risk assessment process that can help identify gaps in current medication safety systems and identify areas for improvement. It includes the Medication Safety Self Assessment® for Australian Hospitals (2015), and the Medication Safety Self Assessment® for Antithrombotic Therapy in Australian Hospitals. 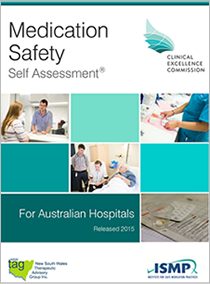 The Medication Safety Self Assessment® for Australian Hospitals (2015) provides a format for users to conduct an overall assessment of their hospital's medication safety systems. People that have used the previous self-assessment should note a new account is required to access the online database. The Medication Safety Self Assessment® for Antithrombotic Therapy in Australian Hospitals focuses on medication safety systems to improve the safe management of antithrombotics - a high risk class of medicine. Users can utilise the results from these self-assessments to implement change, and create a hospital environment where medication related errors are less likely to occur. The program builds on the work of the Institute for Safe Medication Practices who have allowed the Clinical Excellence Commission to adapt their resources for the Australian context. The MSSA Program has been running since 2007. The previous version of the MSSA for Australian Hospitals, and the 2012 ISMP International MSSA for Oncology are no longer supported by the Clinical Excellence Commission. These resources are still available for reference, and hospitals that submitted their data online can access their results in read-only format.